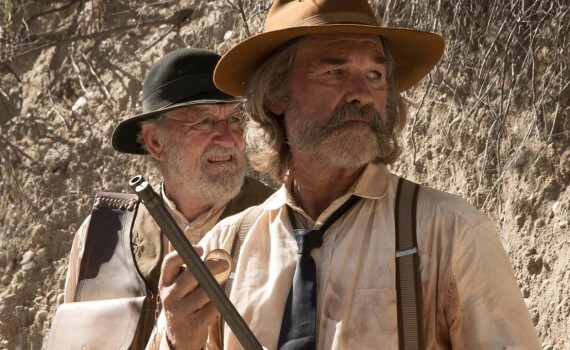 Before Kurt Russell sported his epic mustaches in The Hateful Eight, he brought them to the screen in the comparatively little-seen horror/Western Bone Tomahawk two months earlier. Russell has never been known as the Oscar-caliber type, trending toward action, adventure, comedy, a few scattered dramas; basically movies that fit his talent level. I assume he’s the type of person who knows that he’s not Sir Laurence Olivier or Daniel Day-Lewis, but understands his niche, fills it nicely, and reaps the rewards. But his last two films, both with characters tailor-made for a man who flourishes given Tombstone-esque roles, will stamp themselves on our collection memories as two of the strongest of his roller coaster career. The frontier town of Bright Hope exists peacefully and prosperously, thanks in large part to hardened sheriff Franklin Hunt. But when two no-good bandits accidentally rouse the ire of a group of mysterious, cave-dwelling natives, the one who survives will bring his doom to the quiet village. The savages follow this scoundrel to the town, taking him prisoner along with young Deputy Nick and lovely Mrs. O’Dwyer. A small posse is formed to rescue the two and bring the one to justice, consisting of Sheriff Hunt, backup deputy Chicory, Mr. O’Dwyer, and the richest man in town, John Brooder. The foursome travel through wild lands to bring back their people, but making it back to Bright Hope alive will be an almost impossible feat. With a premise broached a hundred times in other Westerns, Bone Tomahawk still has more surprises in store than you could imagine. The Searchers is the first classic film that comes to mind, and this movie definitely borrows from the past a great deal, in theme, plot, order, language, and action. But where it differs is in its horror element. Never have I seen two styles brought together with such perfection, blending the comfortable & the gruesome with precise talent. And boy is it gruesome. Be prepared, from the very first scene, to witness brutality that you won’t soon forget. But it fits, it’s applicable, and it never feel forced just to gross us out. Bone Tomahawk is a well-acted Western with surprising hilarity, disgusting reality, and a performance by Richard Jenkins as Chicory that I think deserves an Oscar nod. I hope this review doesn’t come across as exaggerant; this film is really that good.